Battle Action Sequences are lots of fun to watch. But for all players alike, seeing the same long-drawn out Battle Action Sequences for the hundredth time will get old. This plugin gives players the ability to fast forward or skip entire Battle Action Sequeneces altogether and show that you, as a game developer, respects the player's time and decision on how they wish to play your game. You could change the buttons to perform these actions, but from the plugin's default settings, you could fast forward by holding down the designated OK button (Z or Space on keyboard or holding the left mouse button down). 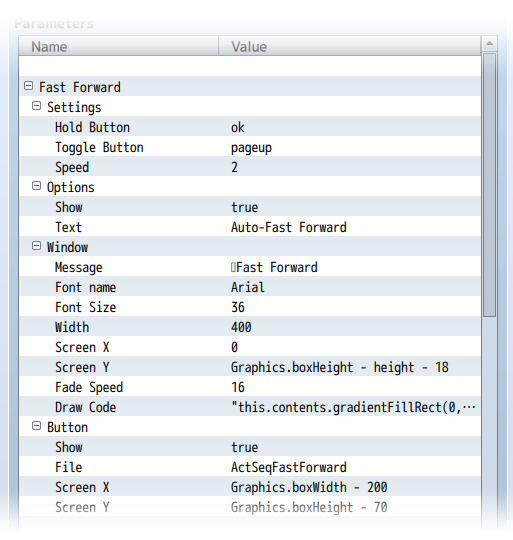 To toggle Auto-Fast Forward, pressing Page Up or Q can do that or by pressing the Fast Forward button on the screen. If you haven't changed the button setup, skipping animations can be done by holding down the designated Cancel Button (X or Escape on keyboard by the right mouse button). To toggle Auto-Skip Forward, pressing Page Down or W will toggle the Auto-Skip Forward feature or by pressing the Skip Forward button on the screen. There are two UI buttons that I've made for you all to use freely with your projects if you don't know how to make them or just want to use it to temporarily take place until you make your own graphics. You can download them from this page. If you wish to make your own UI graphics, just make them like a regular 1x2 spritesheet, where the off graphic is on the left and the on graphic is on the right. There are no frame dimension limitations, but you must use the same dimensions for both frames. The settings below this all pertain to the Fast Forward feature added by this plugin. You can adjust the Fast Forward speed, the buttons used for it, the window information displayed, and the UI button for toggling Fast Forward on or off. These adjust the main components of the Fast Forward effect. The Hold Button is the button that's pressed and held down for Fast Forward to occur and stops when the button is released. The Toggle Button will actually switch between on and off for Auto-Fast Forward, where the player does not need to hold down the Fast Forward button. The Speed adjusts the speed at which the fast forwarding occurs. 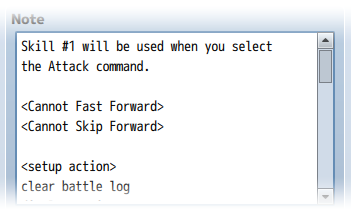 These options determine how the Auto-Fast Forward feature appear in the in-game Options menu. If you want to learn how to add the option to Yanfly's Options Core, look in the section below this one. When Fast Forward is on, a message will appear on the screen to alert the player of what's going on. This section lets you change the window's message, font settings, coordinates, and more. If you wish, you can have a UI button appear on screen for players to click with their mouse to turn on/off Auto-Fast Forward. In this section, you can select the graphic used and the coordinates it's placed at. The settings below this all pertain to the Skip Forward feature added by this plugin. You can adjust the Skip Forward power, the buttons used for it, the window information displayed, and the UI button for toggling Skip Forward on or off. These adjust the main components of the Skip Forward effect. The Hold Button is the button that's pressed and held down for Skip Forward to occur and stops when the button is released. The Toggle Button will actually switch between on and off for Auto-Skip Forward, where the player does not need to hold down the Skip Forward button. The Speed adjusts the speed at which the skip forwarding occurs since skipping is actually a higher powered fast forward. Damage Tally Timing lets you determine what damage counts will appear at the end of the skip. Fade Duration is how many frames the game will take fading in and out between skipping. 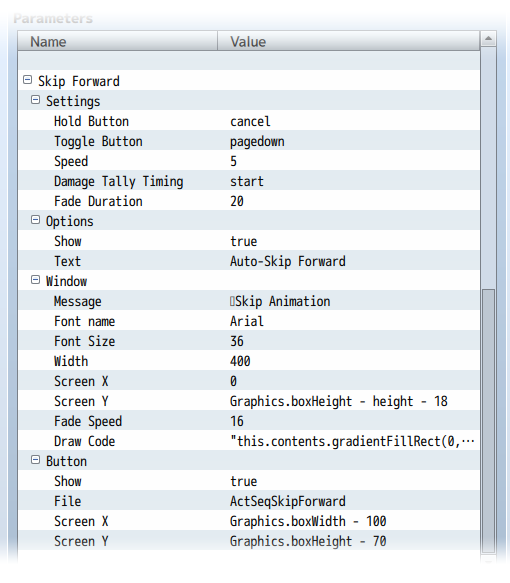 These options determine how the Auto-Skip Forward feature appear in the in-game Options menu. If you want to learn how to add the option to Yanfly's Options Core, look in the section below this one. When Skip Forward is on, a message will appear on the screen to alert the player of what's going on. This section lets you change the window's message, font settings, coordinates, and more. If you wish, you can have a UI button appear on screen for players to click with their mouse to turn on/off Auto-Skip Forward. In this section, you can select the graphic used and the coordinates it's placed at. There are some notetags that you can use with this plugin. Place these inside your items or skills that you want them to affect. - Prevents this specific item/skill from being able to Fast Forward or Skip Forward. Possible reasons on why you want to use such a notetag on such an item/skill could be that this is an item that involves button inputs, or displays data on screen (like a Scan) that you don't want the player to miss out on. Note: Making the speed too high will have possible unforeseen consequences that the plugin cannot foresee nor fix. This is because the fast forward and skip functions function off a macroscale that speeds up the game's update frequency. This does not take into consideration the game's delta time since that's impossible to do without causing other problems. It is your own due diligence as a game developer to find the right speeds for each item/skill that won't break the system. - This will stop Fast Forward and Skip Forward at this point onward. - This will reenable Fast Forward and Skip Forward from this point onward. Automatically fast forwards battle animations. Automatically skips battle animations to the end. 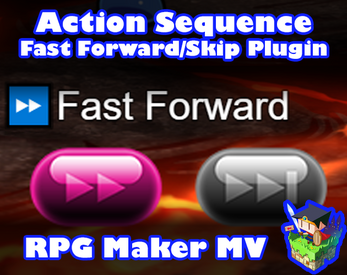 This plugin is made for and tested on RPG Maker MV with version 1.6.2. I cannot guarantee if it works on lower versions. 2. 'RPG Maker Irina' must be given credit in your games. - Added better compatibility with Action Sequence Impact plugin. - Skipping long sequences will go considerably faster now. - UI Buttons also disappear during victory phase.